Try-It, your dog will love it! Easy to learn and fun to do for the whole family. No experience necessary, we'll help you get started! CINCINNATI’S ONLY DOG DOCK DIVING POOL! 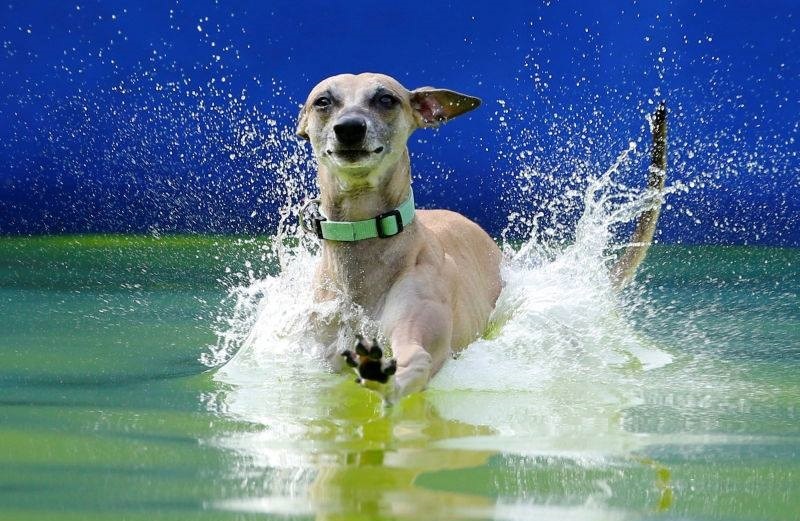 If your dog loves to run, jump and swim, he just may have what it takes to be a diving dog! If your dog loves to run, jump and swim, he just may have what it takes to be a diving dog. This relatively new dog sport has become very popular. It combines four of a dog's favorite activities, running, jumping, fetching and swimming, with one of man's favorite things, competition and whose dog can jump the farthest? If you have never seen dog diving (aka dock diving), it consists of a dog, a handler, an object to fetch, a 40-foot dock or stage, and a long body of water. The dog sits at the far end of the stage, awaiting the signal from his handler. The dog runs at full speed to the very end of the dock as the handler throws a fetch toy out over the water. The dog jumps in pursuit of the toy. When the dog splashes down, his distance is measured where his tail hits the water. The dog retrieves the toy and swims back to his handler (for a very enthusiastic good dog!). 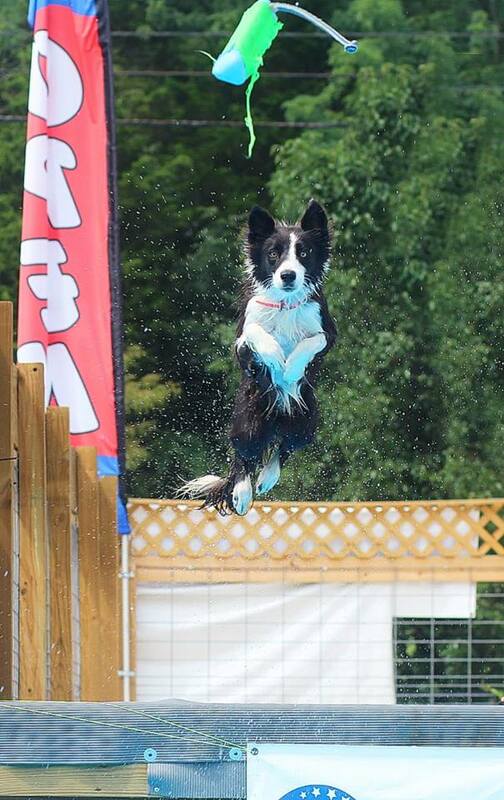 The distance these dogs can dive is amazing and it's not uncommon to see them jump 20 feet in a competition. Absolutely! Any breed (or mixed breed) – Any age can do it. Many jump off the dock in their first Try-It session, for others, they may need more encouragement to feel comfortable with the dock and water. Dogs having a strong toy drive learn the fastest. 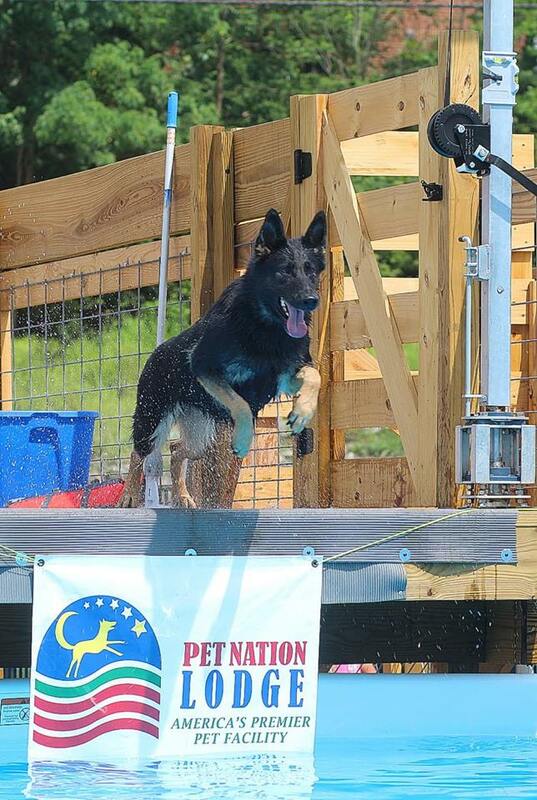 Pet Nation Lodge is proud to be an affiliate club of DockDogs® . We will be hosting events at our pool with Kentucky Dock Dogs and Buckeye Dock Dog Clubs during the warmer weather months (spring, summer and fall) as well as “Fun Days” and practices. To learn more about this exciting new sport, check out www.dockdogs.com. Open to anyone who would like to use the pool. No pre-registration required. You will be sharing the dock with other dogs and their humans, so it is expected that your dog is on a leash that is less than 6’ long (NO RETRACTABLE OR FLEXI LEASHES ALLOWED) and well behaved at all times. Each dog and human “team” will receive 3 (three) minutes on the dock before going back to the end of the line. *A Try-It Orientation Splash is mandatory to make sure your pet can exit the pool safely, swim comfortably (life vests are always allowed), and is not in any visible stress or pain. After successful evaluation, you and your dog can swim, jump and retrieve to your hearts’ desire. You can even work on rehabilitation from an injury. No waiting your turn, no interruptions. This is your time on the dock. Reservations required. For anyone from non-swimmers to experienced dock divers. A knowledgeable team member will give you valuable assistance to get your dog swimming, diving, and perfecting techniques. Reservations required. 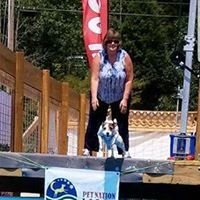 We have professional dog trainers visit the facility from time to time to teach you and your dog different techniques in the dock diving; “Big Air,” Extreme Vertical,” and “Speed Retrieve.” These dates and times will be listed on our Facebook Page. Pricing will vary and will be listed on our Facebook Event and on the Book Online tab on our website once available. Up to date vaccination records are required (Rabies, DHLPP and Bordetella). Need a “cool” birthday party idea? Want to do a fundraiser for an animal rescue? Want to jazz up a club meeting? Then just give us a call! Rent the pool and exercise yard for 3 hours. Call for pricing. · Prerequisites: No breed or age restrictions on dogs. Humans must be 7 years or older. Children must be accompanied by an adult. Must have signed Pool Rules and Waiver. We require that you bring a copy of current vaccinations (Rabies, Distemper, Bordetella) – no exceptions! Use of Pool/Dock constitutes acceptance of Pool Rules and Waiver. · Cancellation Policy: Appointments for rentals and lessons must be cancelled 24 hours in advance in order to receive a refund. · Additional Dogs: Discounts for additional dogs applies only to dogs from the same owner/family. · Rentals/Parties: A Pool Orientation Session is required before your first Pool Rental (unless you have taken any lessons at our pool, which qualifies as such). We ask your understanding that this is mandatory even if you are an experienced dock diver as every dock and location is different and we want to ensure a fun and safe experience for everyone!